Then he grinned all big and goofy, and I couldn’t tell if he was pulling my leg about the cuisine or the fact that he was calling me Billy Boy. He knew I preferred William or Will, but he said those names made me sound like some rich city fart and what kind of numb nut would want that? “Delmus,” I said. He’d tried fighting fires. He’d tried college. He’d tried Wicca, magnet healing, Evangelical radio, nudist camps, and quantum mechanics. For one week he considered living on a Kibbutz in Israel. He’d told me that something as powerful and deep as oak roots worked inside him, driving him to find the three-dimensional manifestation of the ten- dimensionality of our existence. I just nodded. I liked Delmus. He was funny and kind. And no matter what he might sound like, he wasn’t dumb–he had gotten a 31 on his ACT exams, and he hadn’t even been trying. The boy had a lot of horses under his hood, but they were never given any opportunity to show what they could do: a Lamborghini stuck in life’s parking lot. Then he sat back like he’d just showed me a million dollars. “I see,” I said. Maybe I’d been wrong about Delmus. He wasn’t a Lamborghini. Heck, he wasn’t even a Ford. Delmus was turning out to be a go-cart. We stood in the parking lot and he opened the trunk of his Mustang. A woman with short, expensive hair walked out of the Artic Circle and put on her sun glasses. She wore shorts made of some silky stuff that slid over the tops of her thighs like they were made of glass. I was married to Delmus’s older sister, Jill, and married men in Delmus’s family were not allowed to look. I had been told this by Jill’s father: men were all alcoholics of lust and looking was nothing more than a fool bellying up to the bar. “A momentary lapse,” I said and directed my attention to the contents of Delmus’s trunk. Amidst the jumper cables and two quarts of Pennzoil, I saw a crate the size of a toaster. It had small orange letters painted on it in French. Delmus popped off the lid, and there, nestled in the security of Botswanan newspaper, sat a large jar with holes punched in its red-checkered lid. “Now lookie here,” Delmus said and pulled the jar out. Sure enough it had a Smuckers label on the side. Delmus held the jar out to me. I took it and held it up close. What I saw were two beetles about the size of my thumbnail. They shined rainbow green and blue like a skiff of oil in a puddle. They were chewing on a fresh mushroom. “Delmus,” I said. This was the dumbest tall-tale I’d ever heard. If he had learned anything in his time with the Peace Corps, it was not how to lie. “So what did you do?” I couldn’t wait to hear this one. “What else could I do? You can’t run, that’s like throwing blood in shark-infested waters. I looked closely at Delmus to see if he was yanking my chain, but his face was sober as a priest’s. “There’s no way,” I said. Delmus just nodded, and I had to admit his certitude was solid as stone. “African gods,” I said and jiggled the jar a bit. Delmus raised one eyebrow and looked very sly. When I saw he was not going to reveal how much he’d been hornswoggled, nor his methods of smuggling, I handed the little deities back. “So how does it all work?” I asked. That evening Delmus prepared to ingest his god. I was sitting with Jill at our kitchen table. Delmus stood by the sink. He had just sipped a number of tablespoons of vegetable oil to grease up the works. “So are you going to cook it?” I asked. I held back the obvious comment and looked over at Jill. There were seven kids in the Yount family and she was the only normal one in the bunch. Delmus, Youlanda, Heber, Lavell, Eli, Earlette (that was a girl named after her grandfather), and Jill. How she escaped the name curse, I do not know. But I figured their special personalities had begun developing in childhood as a way to bear up under the burden of those names. I wanted to point out that nobody in my family had yet stooped to worshipping bugs, but she could weigh into the discussion on this particular topic like a sledgehammer, so I just smiled and turned back to Delmus. We both knew I had won this match without having to say a word. Delmus transferred one of the beetles from the Smucker’s jar into a normal glass. I stepped over and peered down into the bottom of the glass with him and saw the thing spinning its legs trying to get ahold of the side. “You’re just going to swallow it whole?” I asked. I looked back over at Jill. Wasn’t she going to say something to her brother? But Jill just gave me a look that said this was as normal as cherry pie. Who knew where that bug had been? And the enterprising natives gathered them up to sell to stupid tourists like Delmus. I pointed out that Delmus had not cooked this bug, but he didn’t listen. “I think I’ll stun it with a little crunch,” he said. Then Delmus brought up the glass. There are moments of horrid fascination when I can’t look away. Moments like when Skip, the Younts’ dog, barfs and then eats his vomit, or when I catch snakes mating on some nature program. I was having just such a moment. This was a large bug with a lot of wiggle in it. For all we knew, Delmus’s friend could have found this thing living all snug and tidy in some rhino turd. Delmus jiggled the glass like he was trying to get the last piece of ice out of a soda. 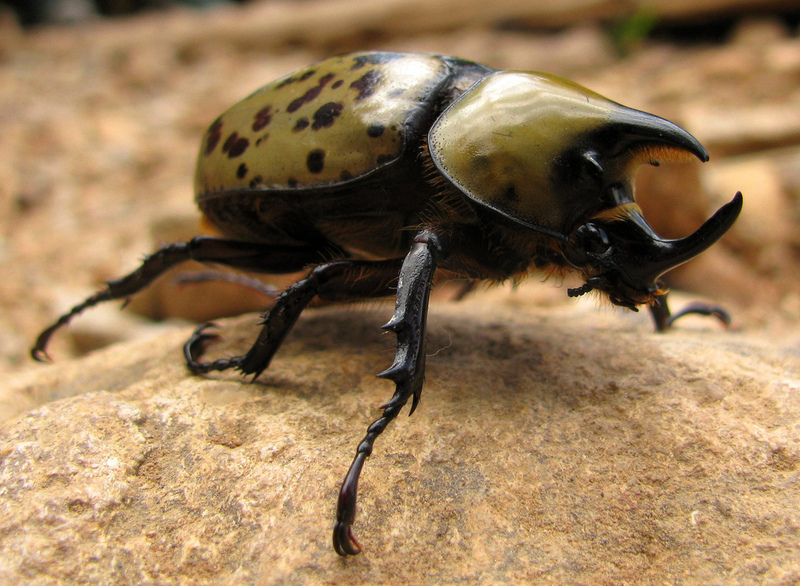 Then the beetle slid down towards Delmus’s open mouth on its back, legs whirring in the air. It approached the rim. I cringed. And then it disappeared into Delmus’s mouth. He gave it a quick crunch and gulped it down. Delmus simply had to be a different breed of human. There was no other explanation. He winced and put a hand to the valley of his neck. He gulped again, a third time, and then he dashed for the fridge. Delmus didn’t answer; he grabbed a gallon of milk, ripped off the lid, and began to chug. Delmus was not a tidy chugger, and a full pint must have spilled out of his mouth and onto his neck and shirt. But he got enough of it in him evidently to wash the beetle down his gullet because he put the milk on the counter and took a breath. For a brief moment I wondered exactly what kind of damage a beetle might do to a man’s intestines. Could it climb back out? Or would it eat its way through the stomach wall and live in the chest cavity? Then Delmus began to jump about. A dozen hops later he stopped and held perfectly still like a man listening for a soft creak. Then he relaxed. I looked at my wife. I couldn’t believe what I had just witnessed. “Jill,” I said. Nothing noticeable happened right away. Then Delmus took to running. I’d never known him to run, but Delmus took to it like an antelope. Said he felt mucho burrito. So instead of driving the four-wheeler to check on something in his father’s fields, he’d run out and back. He ran with the sheep dogs and let them taste the dust of his heels. He’d run the five miles into town and back without a second thought. But it didn’t stop with running. A week after the ingestion episode, he came to help me drywall part of our basement. Actually, he did the drywall and I fetched. After he’d put up the tape and applied the first layer of mud, I sent him off. I wasn’t handy, but I could at least clean up. I rolled up the plastic, swept, and wiped away stray blobs of mud, then I walked out to the garage with a load of garbage to put in the can. That’s when I saw Delmus standing there holding our sack of Dog Chow. I’d heard about people doing this, but never actually seen it. “You’re not eating the dog food,” I said. Delmus got a deer-in-the-headlights look. The man simply didn’t know how to lie. I wouldn’t let him out of the garage until he told me if this is what he’d been eating in Botswana. I found out they fed him fine over there, and he had only started craving dog food the day after he swallowed that bug. Of course, none of this odd behavior proved anything. I was, after all, dealing with Delmus. Craving to run and eat dog food were most assuredly some odd placebo effect, and I tried to make him see my point. After I finished my lecture, he hung his head. But I could see that’s exactly what he’d hoped for. “Nothing works like that,” I said and shook my head. “Come on.” And I put my arm around him and I figured this would be the end of it. Jill gave me a look. “She won’t do it,” said Delmus. I was not fond of examining people’s disgusting sores. As a child, I’d looked in the big, red self-diagnosis medical book my parents kept. The pictures inside horrified me. That was why I had gone into computers instead of becoming a doctor. But Delmus sat there looking like he might have a brain tumor and this might be his last day on earth, and so I scooted over and began to pick through his hair like an obedient primate. It didn’t take long to find it. It was red and angry, about the size of a marble. There was no white head to it, although it did have what looked like a seam running across the face. All those pictures in the family’s big red book came rushing back to me. “Judas Priest,” I said in disgust. Other words had come to mind. But Jill had made me give all such words up during our engagement. None of the men in her family swore, she said (although I’d heard notable exceptions to this rule), and she wasn’t going to be the one to introduce the habit into their line. I figured marriages were like castles, made up of a lot of little bricks of courtesy, good times, and sacrifice. Giving up cussing was my heap of sacrificial bricks. I now used words like heck, fetching, flipping (as in abso-flipping-lutely), crap, hells bells (that one, Jill said, was iffy), good night, shoot, scrud, sugar, and poop. Sometimes I could get away with substitutes in Spanish or Czech. Some words I refused to use; “gadzooks” was one of those, but “holy” had become a power word–holy cow, holy moly, holy flip, holy holy. Sometimes I just made phrases up and tried them on; you can call someone a “freaking raspberry tart,” and if you think about it long enough, it begins to take on an air of the profane. Still, I was living in a world of words that fit but just didn’t carry quite enough punch. I had been sissified. “What is it?” asked Delmus. And then the sore opened. Inside, the sore was all gray and filmy, covered with some mucus-like substance. Delmus had fallen trying to climb into the tractor a few days back, and at first, I thought he must have chipped out a part of his skull and this was a part of his brain poking out. But then the sore blinked. And blinked again. I snatched my hands back in horror. The worry in her voice must have freaked Delmus. “Is it a tumor?” he said. He sounded like a frightened little boy. I took a breath, and tried to calm myself. “I don’t exactly know,” I said. I took another breath. If a doctor could examine these things, so could I.
I mustered my courage and lifted the hair back again. I was calm, collected, and 100% sure that what I was looking at in the back of Delmus’s head was an eye. We took Delmus to the emergency room. The doctor there looked at it and called over another who looked at it and called yet another. All told, over the course of three days, I think we saw a dozen doctors. In the end, after they’d run all the tests and taken images with every machine in their arsenal, they decided to operate. They removed the eye, patched him up, and gave him the hardest anti-biotics known to man. The doctor let us see the thing–it had an iris, lens, cornea, retina, and what looked to be the beginnings of an optical cord. But none of them could offer any suggestions on what had triggered its development. Delmus was told to come back in a few weeks, but we knew they didn’t have a clue; they wanted to study him and write up his case for posterity. And I thought this was a good thing. It might help any other idiot who wanted to swallow an African turd beetle to cure aches and pains modern medicine couldn’t touch. The problem was that Delmus went back to the doctor two weeks later, got a clean bill of health, and then immediately began to grow another eye, this time in a different location. He revealed it to us in the wee hours of a Wednesday morning. He had a key to the house and simply came in, calling out our names. We were, luckily, engaged in nothing more than a sound sleep. Delmus flipped on the lights in our bedroom and stood next to my side of the mattress with a tee-shirt wrapped around his head. “Billy Boy,” he said, his voice all trembly. I peered up through the light, and there just to the side of his left temple was another eye. “I’m a freaking Cyclops,” he said. The eye was closed, but there was no doubt what it was. We told Delmus to go back to the doctors for another surgery, but he was convinced that it was the god inside him that was doing this. Besides, he pointed out, there was no surgery to cut out the voice. He had a phone. Which meant he’d come to us for more than our One Low Rate. He didn’t get Masego on the first try: the man had to be fetched. Obviously, Masego was not one of the phone-toting Bushmen. About three hour later, Delmus called again, and this time Masego was among the crowd at the other end. Delmus carried on about all his woes, and then when it was Masego’s turn, Delmus just nodded and said ya, ya, ya. The upshot of the conversation was that there were good gods and tricky ones and others that were simply mean. You couldn’t know which was which until they possessed you. This one happened to fall into one of the latter two categories. Of course, Masego had supposedly explained all this back in Botswana, but Delmus, being Delmus, had simply ignored the risks. Masego told Delmus it was very simple. He couldn’t kill the god, but he could entice or drive it out of his body and into something else that gods liked. Things like dogs, ancient trees, and lightning. It was going to take chanting and clapping and some special trance dance. “Oh, now we got us a believer?” asked Delmus. No new things. That was obvious. I just stood there and shrugged. Why not? We were, all three of us, bright and consenting adults. It might end up being a journal moment. “I’m not doing any drugs or weird crap,” I said. We couldn’t find a handy dog. Yes, we have a little Terrier, Mr. Smee. But he is not a dog, really. We did not think it humane to dognap someone else’s pet, and the animals at the shelter didn’t count–buying one for this dance felt too much like a Nazi medical experiment. I wasn’t going to have the neighbors gawking as Delmus did his thing around a tree, so Delmus decided on lightning. “Lightning?” I asked. I looked outside at the clear, bright sky. I glanced over at Jill. I could see a little worry in her face. I was not a handyman, but even I knew you didn’t go grabbing live wires in your house. We helped Delmus make a number of pinto bean rattles. He used a marker to write our chant out phonetically on the back of a blue flyer advertising furnace cleaning. The rite required fire, and so we dipped into Jill’s stockpile of scented candles. And that’s how we started–me and Jill sitting in the middle of the living room floor with sunflower and bayberry candles burning on a plate between us. We read out our chants and Delmus danced circles around us. Masego had said that it sometimes took a full night of dancing for the healing trance to fill a man up inside. After about twenty minutes I didn’t think my arms had a snowball’s chance of clapping and rattling for more than an hour. But we sometimes surprise ourselves in our extremities. We chanted, and Delmus danced for more than four hours. He danced through dinner and sunset and into the dark night. At about 11 o’clock he stopped. “I’m just about crazy,” he said. “I think it’s time.” We were all sweating and in pain. Delmus put on my rubber boots, then he walked over to the exposed light switch, and looked at me. Delmus put his left hand behind his back. Then he reached out with his right hand, his thumb and forefinger on either side of the box. When he put his thumb on the exposed copper of the black wire, he scrunched up his face, but he didn’t let go. The muscles on his arm stood out. The light in the room seemed to dim. Then Delmus’s head flipped back with a jerk, and I thought he was going to yell, but nothing came out. “Delmus?” I said. How was I supposed to know when to pull him off? We watched in horror for a few moments at Delmus’s silent scream. His hair began to lift, and then his voice kicked in like a bullhorn. This shout broke our spell. And I could hear in her voice that this wasn’t right at all. I reached for Delmus. The light in the room brightened. But before I could pull him off there was an enormous pop like a mighty discharge of static electricity. Delmus flew through the air. Then the fixture above me sparked and plinked, and everything in the house went dark. Even the candles had blown out. I heard Delmus thump to the floor. Jill and I both dropped to our knees and fumbled about trying to find him, and when we located him, trying to see if he was moving. “Is he breathing?” Jill asked. I felt my way to his head, then I licked my hand and put it close to his mouth and nose. I couldn’t feel his breath. I put my ear to his chest. I listened, and then I caught it. “He’s got a beat,” I said. We knelt there for what must have been ten minutes, blathering to Delmus and wondering what we had just done. We never even thought of calling 911. What would we say? Then Delmus stirred and rolled over. He felt something, there was no doubt about that. We all fell silent and moments later I heard a noise coming from some corner of the house. “What’s that sound?” asked Delmus. It was Chuck Berry playing in the bedroom. “But it doesn’t have any batteries,” said Jill. Even in the dark, I could see her pause and set herself to defend her point. “It doesn’t have batteries,” she said. I went downstairs and reset all the breakers. The lights all came back on and I walked back upstairs. Delmus and Jill had moved to the bedroom. He was bug-eyed and a bit askew. The arm he’d touched the wire with hung like a wet noodle at his side. Jill held the clock radio up for me to see. She had taken the battery cover off, and there was nothing inside. “But that can’t be,” I said. I did, and when the lights went out, the radio played on like we were linked directly into the Hoover dam. “How in the world…” said Delmus. Then he fumbled for the lamp on the drawers with his one good arm, followed the cord, unplugged it from its socket, and then plugged it into this one. The lamp flickered and then glowed softly in the darkness. We stood there in silence. It had to be the result of some jerry-rigged wiring. “Maybe Jill didn’t trip the right breaker,” I said. Then the lamp and radio faded. And we heard and saw it move down the house. That’s the only way to describe it. First the master bathroom light flickered. Then the hall light switched on and off again. The blender revved at what sounded like frappe. The microwave dinged. Another flicker down the hall, then all was silent and dark. I hadn’t really believed this would work–it was going to be just another Delmus moment. But now all my tidy explanations failed me. “Pull them out,” I said. It was in the house. It was in the wires. I began calling out the appliances room by room. I yelled down to Jill to pull the plug on the washer and dryer downstairs. The last thing I wanted was that thing lurking in the toaster. When we had pulled anything with a cord, I went back and tested the clock radio in the bedroom. It would not work. I tried it in half a dozen other plugs, but in each it was dead and dark. I unplugged the radio from the last socket. “It’s still here, isn’t it?” asked Jill. All three of us walked downstairs and flipped the breakers. The lights came back on. And we waited a very long time. I was speechless, but Delmus wasn’t. “I don’t think I’m going to give that other one to Andi,” he said. Electrology. The study of electrical gods. Who knew where such a study might lead him? And at that moment I realized that while Delmus was not a Lamborghini, he wasn’t a go-cart either. I looked at him with newfound respect. Delmus was some experimental vehicle that just might be the one to take us all in a whole new direction. The operation to take out Delmus’s second Cyclops eye won Andi’s heart. While he was recovering, she came to visit, and he told her the whole story and showed her the eyeballs he kept in a solution in a pickle jar. Andi decided that was the grossest, most tragic, most romantic story she’d ever heard. I suppose his afflictions had made him into some kind of noble-hearted doofus, and she just happened to be a sucker for that kind of man. I have refrained from pointing out to Delmus what such an oddly fickle woman might bring to a marriage. Jill, of course, used the seeming fact that Delmus had been right about the beetles all along to muddy the waters of our discussion about the quality of our family lines. Me? I tell them all I don’t know what to think. But sometimes I lie awake at night looking at the lamp, the red lights of the clock radio, and the dark holes and slots of the wall sockets, wondering if it’s still there, or if it’s gone hunting on the public grid for whatever it eats, uncertain if it would return from such a foray. Heaven forbid it should multiply. This I know: a small disaster’s coming down the line. You simply can’t have a god running loose in the wires. And when it breaks, I’ll be pinning my hopes on a hick with some dark horses under the hood.